Long term, we hope Universal Chance can benefit a great number of diverse communities in multiple locations around the world. However, as a young organisation we recognise the importance of not ‘running before we can walk’ and have decided our initial focus should be a single project we can all get behind, in order to build a blueprint for the future. To that end we have decided to support Buhinga School in the Fort Portal region of Uganda. 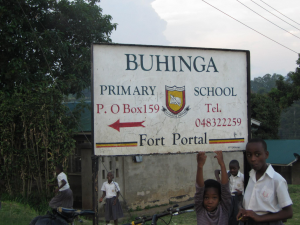 Buhinga was a well-run school before the time of Idi Amin, but unfortunately it is now run down and dilapidated and the state is effectively unable to support it. The school is close to an area where 2 of our trustees have family connections. This gives us greater confidence in our ability to understand the needs of the school to ensure that our funds are well managed and utilised to their maximum potential. We want to raise enough money to not only rebuild the school, but also to make it sustainable going forward. We visited the school for the first time in September 2012 to meet with the headmaster and ascertain the areas requiring development. We were greeted by all 1600 pupils and made to feel incredibly welcome – the staff and children are amazing, but in great need of our support. Classes can have close to 100 pupils in, each having to share a book between 10. Teachers are living in condemned buildings with severe structural issues – a particularly grave concern given that Uganda is earthquake prone. The school motto, which forms part of their crest is “The struggle continues”. There is a lot of work to do at Buhinga, some simple changes and some sizeable ones, but we are dedicated to keeping our promises to the headmaster and the kids that we will help make a difference and hopefully lessen “the struggle”. Read on for more background to the school and the challenges faced by it.